A throwaway comment by Glastonbury Festival founder Michael Eavis kicked off quite a media storm – dubbed ‘womblegate’ – after he said he was ‘cross’ that The Wombles had been booked… although he was laughing at the time. Michael Eavis was being interviewed by presenter John Ford on local radio station BBC Somerset on 8 June (on the Emma Britton show from 9 am to 12 noon). A listener had asked for Take That to play Glastonbury, and Eavis replied that they’re “not quite our audience really… they’re hugely popular but I don’t think that the Glastonbury Festival is quite their scene really”. You can play the one-minute clip below, and listen to the full show on BBC iPlayer until noon on Wednesday 15 June (the Wombles section is at 2:25). 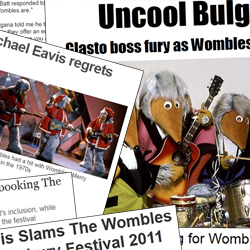 By the following day (9 June), Twitter was ablaze with hundreds of Wombles fans defending their honour and saying they’d be great at Glastonbury. ‘Wombles’ was a trending topic on Twitter by lunchtime, which led to even more people asking why the Wombles were trending, or adding their support – or in some cases criticism. Throughout the day, many news organisations picked up the story, including Telegraph.co.uk, Guardian.co.uk, Metro.co.uk and the Reuters news agency. But as the reports spread, the story seemed to be taken more and more seriously, losing sight of the original lighthearted discussion. 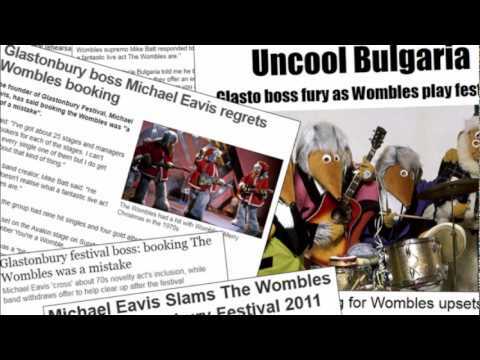 The London Evening Standard website even claimed that Michael Eavis was “angry at his staff” and that The Wombles “had been booked without his knowledge but could not now be cancelled”, while The Sun reported “Glasto boss fury” as Michael Eavis “slammed staff for booking THE WOMBLES” – though they did have a fantastic headline, “Uncool Bulgaria”.